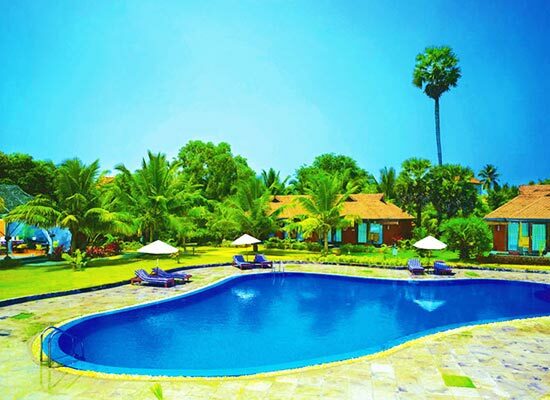 "Positioned on the south western tip of India in Kovalam, Poovar Island Resort, is set amid lush surroundings and boasts of a tranquil ambiance. Spread in an area of 25 acres of land, the resort gives you a feel that you are staying in a heritage property, which is filled with all world-class comforts. One of the best heritage-style hotels in Kovalam, Poovar resort offers a comfortable stay amidst flawless hospitality services. The resort has wonderful spacious rooms and cottages, which have a peaceful ambiance and have all the comforts for the guests. You can pick from land cottages and floating cottages. There are a few dining venues and well-stocked bars serving finest of food and drinks. Avail the best of Ayurveda treatment, therapies and massages by experts. Gym, boutique, swimming pool, games, conference facility, yoga class are some of the other conveniences. An interesting kind of accommodation option, floating cottages of the resort are filled all kinds of facilities, one can wish for. 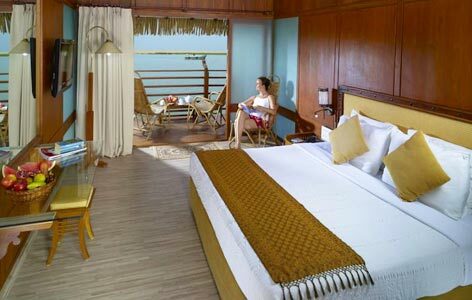 There is a private deck and the bedroom comes with glass paneling so that guests can savor stunning views of the beach and the backwaters. The setting of the room and the décor is traditional and sophisticated. Complete privacy of the guest is maintained. The en-suite bathroom offers complimentary toiletries and comes with a separate bath cubicle. TV with satellite connection, hair dryer, radio and clock, direct dial telephone, ironing board, tea/coffee maker and digital safe are some of the other comforts. Placed on the ground floor, the Premium Deluxe Rooms come with a verandah that offers wonderful views of the coconut plantations. These rooms are a mix of traditional interiors and modern world-class conveniences such as digital safety deposit safe, hair dryer, clock and radio, ironing board, tea/coffee maker, mini bar, direct dial telephone and so on. The attached bathrooms are equally plush and feature bath cubicle, round the clock hot/cold water supply, Jacuzzi and complimentary toiletries. Spacious and luxurious, Premium Land Cottages have a warm décor with pastels colors of yellow and beige, offering a soothing effect on mind and eyes. These cottages have a private setting, offering complete privacy and peaceful ambiance. Round the clock hot/cold water, complimentary premium toiletries, bath cubicle and a Jacuzzi are featured in the en-suite bathrooms. Have a pleasant stay amid modern facilities and amenities like digital safe, radio and clock, mini bar, direct dial telephone, hair dryer, TV with satellite channels, ironing board and so on. Featuring a balcony, offering wonderful views, Superior Land cottages offer capacious accommodation. The balcony offers the views of the garden. Lie down in the hammock, relax and treat your eyes to the wonderful views. Satellite television, direct dial telephone, digital safe, hair dryer, ironing board, tea/coffee maker, radio, clock etc. are some of the comforts of this room. The spacious bathroom has bath cubicle, hot/cold water and a vast range of toiletries. 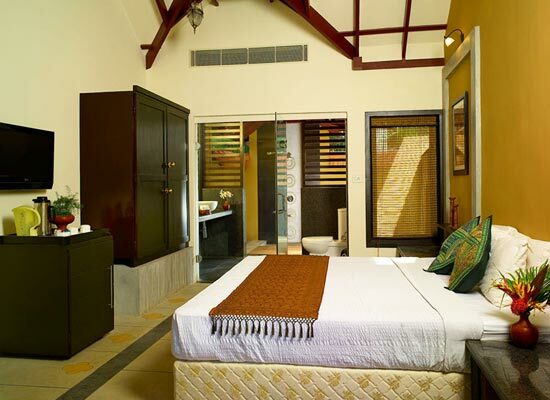 The eco-friendly Ayurveda cottages are located in the Ayurveda village of the resort and aim to offer complete peace, relaxation and rejuvenation to the guests. Though the décor of the room is traditional but they come with contemporary amenities and facility. Enjoy comforts such as ironing board, hair dryer, satellite TV with premium channels, radio and clock, mini-bar, tea/coffee maker, digital safety deposit and more. Even the attached bathroom has all facilities such as complimentary toiletries, hot/cold water etc. Some are on land and other are floating. The on-site fine dining restaurant Tiffins serves lip-smacking dishes of Indian, Continental and Asian fares. Specialty is the authentic cuisine of Kerala. The hotel can accommodate 62 guests at a time. The special art kitchen is the highlight. 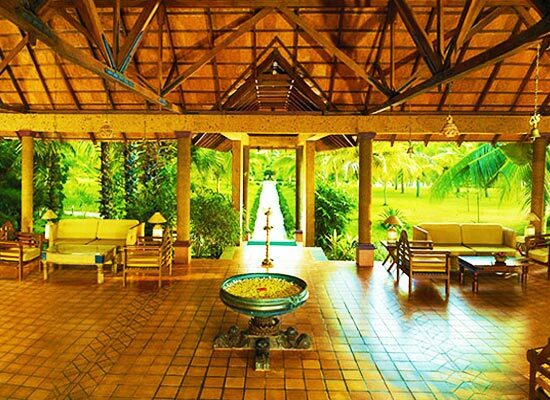 Ayurveda Restaurant in Poovar Island Resort serves only vegetarian delicacies to its guests. The trained chef prepares some lip-smacking vegetarian dishes using freshest of ingredients and aromatic spices. Food here might also be prepared as per the Ayurveda treatment you are seeking. The sunken Pool bar at the swimming pool of the hotel is a wonderful place to unwind and relax. Place an order for your favorite juice, alcoholic drink or non-alcoholic beverages. Guests have an impressive menu to choose from. The menu also includes finger foods. Another special bar at the resort, the Sunset Bar serves both alcoholic as well as non-alcoholic beverages. Thiruvananthapuram is one of the famous tourist destinations in India. The backwaters and beaches of Thiruvananthapuram attract tourists from all over the world. 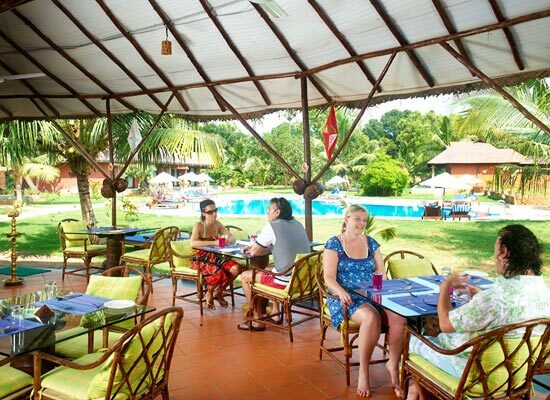 The different ayurvedic resorts and centers here are a good way to de strees yourself. The different museums of Thiruvananthapuram provide you the insight about the ancient history of the place.